Little is known of Charles beyond the fact that he enlisted into the Royal Berkshire Regiment at Newbury on 20 September 1913 giving his residence as Kintbury. As a member of the 1st Battalion Royal Berks, he crossed the Channel on 13 August 1914, and fought at Mons and subsequent actions until he met his death in action on 11 November 1914 during the desperate defensive actions of the 1st Battle of Ypres. There are no Harris entries in the 1911 census of Kintbury, and no sign of Charles or of Frederick Harris. 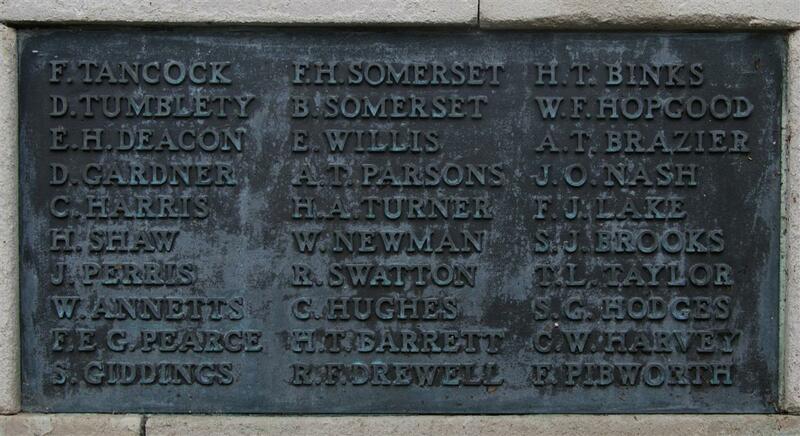 Frederick’s name appears on the Kintbury War Memorial, whilst Charles’ does not. Could this be another confusion of names? In the Active Service Roll published in the Newbury Weekly News up to spring 1916, the name Charles Harris, 1st Royal Berks, does appear – as a Hungerford resident. However, the roll generally indicates when a name is that of a man who died – and it never shows Charles as deceased. Nor is he recorded on any memorial in Hungerford, which includes a roll of honour of all who served. In short, Charles Harris is an enigma, and no known connection to a more famous current Kintbury resident - Robert Harris - author of Enigma (among many titles). At first look it might appear unreasonable to attribute the name C HARRIS on the Newbury Town War Memorial to Gordon Harris, but a contemporary source, the programme for the dedication and unveiling of the memorial, gives G HARRIS in the same position. This is confirmed by photographic evidence: an early photograph of the memorial has a small portion of tablet 13 visible. By chance this includes the name G Harris. The original stone tablets were replaced in 1950 by the current bronze tablets; at this time a number of errors were introduced, particularly in the initials of the deceased. Gordon was born in Newbury in 1892, the son of James George (known as George) Harris and his wife Kate, née Wright. He had two siblings, May (born 1890) and Una (1901). George was a blacksmith employed by Newbury Corporation. The family lived at 5 Wellington Terrace (now 47 Russell Road) until 1912, when they moved to a new house in Kingsbridge Road named Montreaux. After George left school he started an apprenticeship with Mr Whiteman, a Newbury printer, learning a useful skill, one that offered plenty of employment opportunities. After completing his apprenticeship he worked for a short time for a printer in Abertillery in Wales and for George Cosburn, one of Newbury’s best known printers (his Newbury & District Directories have been an invaluable source during the research for these WW1 stories). In the early months of the war hundreds of thousands of men volunteered to serve in the armed forces, but it wasn’t enough. By late 1915 it was obvious that conscription would soon be introduced. In an attempt to stave of this unpopular measure the minister responsible for recruitment, Lord Derby, introduced a new scheme to boost voluntary recruitment. The Derby Scheme encouraged men to come forward and sign up for service in the future, as and when they were needed. The scheme was widely publicised and included encouragement to sign up for immediate service. The Reading Mercury of 13 November 1915 included a list of men who had enlisted in Reading since the 4th November – amongst whom was Gordon. However, he did not sign up via the Derby Scheme, but directly into service. A few months later he would have been conscripted, at least by signing up as a volunteer he was able to choose the regiment he joined. In Gordon’s case this was the Rifle Brigade – confusingly named as this was not really a brigade. An infantry brigade of 1915 comprised four infantry battalions and associated artillery, engineers, headquarters and other ancillary staff; it was the basic fighting unit of the British army. Regiments were organisations that recruited, trained and supplied infantry battalions to the fighting formations. The Rifle Brigade was in truth a regiment and supplied numerous battalions to serve at the front. 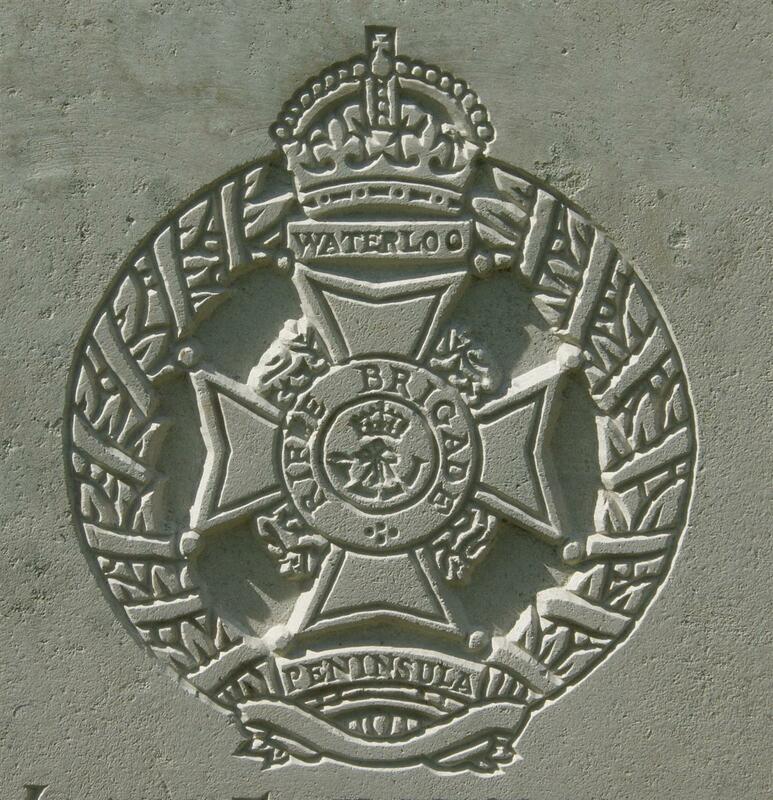 Badge of the Rifle Brigade as used on CWGC headstones. Gordon was posted to the 16th (Service) Battalion – one of the ‘Service’ battalions created in the early days of the war to take the huge influx of new recruits, who signed up for the duration of the war as compared to the normal, ‘regular’ army term of 12 years. The ‘service’ designation reflecting this limited term of service. When Gordon joined the battalion it was in training at Hursley Park, just outside Winchester (now an IBM R&D laboratory). In March 1916 the battalion crossed to France along with the rest of its Division (the 39th), which comprised the 116th, 117th and 118th Brigades, Divisional Artillery, etc. The 16th Battalion, Rifle Brigade was one of the infantry battalions in the 117th Brigade, along with the 16th and 17th Battalions, Sherwood Foresters and the 17th Battalion, Kings Royal Rifle Corps (another misleadingly named regiment). The battalion spent its first months in France in the Festubert sector, north of the area of the Battle of the Somme. In August 1916 they marched south to the front near the north bank of the River Ancre, scene of several abortive attacks since 1 July. On 3 September, the battalion took part in an assault on German positions – which resulted in heavy casualties (30 killed, 235 wounded and 176 missing). Gordon survived this carnage and the ensuing weeks as the battalion took steady, but not heavy, casualties as they spent time in and out of the front line. In November the battalion moved north, to the Ypres area. 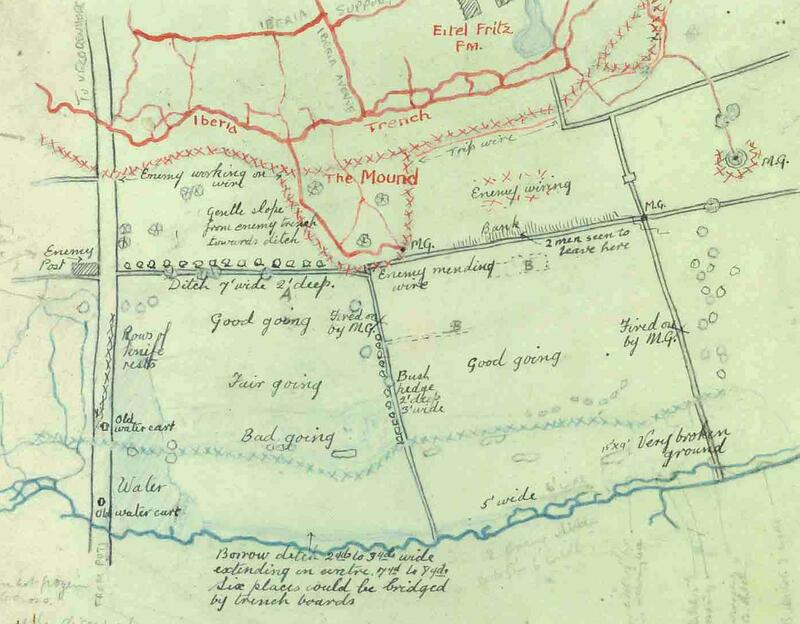 Report on Raid carried out on the Mound on night of 13/14th February, 1917. Our casualties were severe, and caused chiefly by rifle fire while crossing Non Man’s Land. All four Officers were hit, one killed, and 44 Other Ranks are casualties. Up to the present 41 on these have been accounted for. It is believed that two men, who were shot dead on the wire on the right of the Mound, were not brought in. This is not yet certain. [The full report is reproduced below]. Gordon was reported missing on this day – perhaps he was one of the two chaps believed to have been shot dead on the wire, or perhaps he was the third soldier unaccounted for after the raid. Mr and Mrs Harris, of Russell-road, Newbury, have received a card from their son, Lce-Corpl G E Harris, who is a prisoner at Gottingen, Germany. He says:- “Thanks for parcel and money. The parcel was fine – all tinned stuff, just the thing for here. Send one often, and put in cheese, butter, cake, loaf, cocoa, milk, jam, and anything else. We are allowed to smoke now, so send on an old pipe – the calabash if you do not use it and a bit of bacca. Send some needles and cotton, and soap. Any open novels will be very acceptable, and a pack of cards. Mr and Mrs George Harris, of Montreaux, Kingsbridge-road, Newbury, have received official notification from the War Office that they must assume that their son was either killed on the 13th February last; or has since died. Rifleman Gordon Harris joined the 16th Rifle Brigade in November, 1915, and after four Months training at Seaford, he was sent to France. He went through numerous engagements without a scratch. It was after a night raid on the enemy trenches on the 13th February that he was posted as missing. Since that date his parents have made efforts to obtain information as to his fate, but nothing has been heard of him. Rifleman Gordon Harris was apprenticed to Mr Whiteman, printer, formerly of Northbrook-street, Newbury, and afterwards was employed at Abertillery, South Wales, and at the late Mr Geo Cosburn’s, Market-place, Newbury. Gordon has no known grave; he is remembered on panel 48 of the Menin Gate memorial to the missing of the Ypres Salient. Every evening at 8pm the Last Post is sounded under at this impressive monument by members of the local Last Post Association. The people of Ypres (today known by its Flemish name - Ieper) have never forgotton the sacrifice made by the British Empire forces in the Great War - over 54,000 of whom are remembered on the Menin Gate. Once attended only by a handful of visitors this little ceremony has in recent years become a major tourist attraction with hundreds attending each evening. Locally he is remembered on tablet 13 of the Newbury Town War Memorial and on the splendid memorial in the United Reform Church, Newbury. Sketch map prepared during the planning of the raid on the Mound. In accordance with orders the Preliminary Assembly in our Trenches was complete at 12 midnight. Tapes for the Assembly in No Man’s Land, and Guiding Tapes through gaps in the wire had all been laid out without any difficulty or trouble. The borrow-pit in front of our trenches had been bridged and the passage to the assembly tapes presented no difficulty. At 12.15am many witnesses, both in the Raiding Party and also in the neighbouring trench garrison, assert that 20 or 30 of our shells were put on the objective area. This had the effect, as regards the Right Flanking Party, of making them think that the barrage had already started. At 12.23am the assembly in No Man’s Land commenced, and was carried out in good order. The Right Party assembly was complete in good time in No Man’s Land, and they waited for the barrage to begin. The Centre Party the assembly was complete ¾ of a minute before the barrage began. On the left, the assembly and the barrage seemed to almost coincide; the length of time they had to wait was negligible. It is not clear why it took so much longer on the Left that it did on the Right, but it did not lead to confusion. The Right Party advanced to the attack, and the leading wave got close up to the German wire. The Sergeant, who was leading this wave, found that there was no gap immediately opposite him. He immediately moved to his left where after considerable difficulty he found a narrow gap not more than a yard wide. (At this point the officer, Lieut Wilson, was wounded). A small party of about six men accompanied the Sergeant, and he went through this gap into the German trench, and established his bombing block luckily exactly at the communication trench where he was supposed to place it. The remainder of the party lost themselves in their endeavours to find this gap, and wondered on down the wire. They were, however, unable to get in. The party that did get in found 5 to 10 Germans, dead and wounded, in the front line trench almost at their point of entry, which doubtless accounted for the ease at which they got in, and another party of Germans retired in front of them down a communication trench. The bombing party blocked the trench, and threw all their bombs. Then the before mentioned German party turned on their tracks and began to bomb our party, driving them back. Having finished their bombs, they were compelled to evacuate the trench. This was probably about 14 minutes after they entered the German trench. The Centre Party advanced to the Mound, and easily got in. Lieut Robinson leading, as arranged, and one party bombed down the sap towards the German Front Line. Lieut Robinson, however, appears to have gone right-handed over the top, and got into the German Front Line somewhere about the Junction of the Tramway, This caused the remainder of the party to split up and more or less lose direction, some even passing right-handed of the wire surrounding the Mound, and got into the German Trench right of the Junction of the Tramway. This part consisted of a L/Corporal and two men. Lieut Robinson endeavoured to establish touch on his right and left, but failed to do so, and on the rocket signal going up to withdrew according to the programme. While advancing to the German Trench they were subjected to heavy rifle fire, and immediately on their withdrawal the Germans followed them up with bombs – presumably these came from the Left Flank up the Mound Sap. Lieut Robinson was hit in the leg by a German bomb, and fell into the German wire, but was assisted across to our lines by a Rifleman. The left party advanced straight to the German wire, and when threequarters of the way across, the Officer in charge (Lieut Maclehose) was wounded, and subsequently died. This caused considerable confusion in the party, most of whom, however, carried on. They arrived at the German wire, but failed to find a gap, with the exception of a Lewis Gun Team, consisting of four men, the other two having been wounded, and the extreme left bombing post which now consisted of four men also. They got on to the German parapet, and bombed down the trench towards the Left, and having exhausted their bombs, retired on the rocket signal going up. The remainder of the Left Party failed to find any gap, and never crossed the German wire. They were subjected to considerable rifle fire, both from the front line trench, and some allege from a second line trench. The German Artillery retaliation was moderately severe, a large number of .77s being put on to No Man’s Land, and heavier calibres towards Cambridge Terrace, Hill Cotts and New Cotts, where also a considerable number of Minenwerfer fell. The sequence of calls for artillery support appears to have been:- Golden Raind Rockets as SOS, which were sent up with great persistence during the whole Raid; Green Rockets were also sent up but did not appear to have any effect except to cause a slight lengthening of range. We also sent up German Green Rockets in our own lines in the hope of mystifying the enemy; this, however, was not successful. Towards the latter end of the Raod from 1.5am Double Red Rockets were sent up by the Germans, the last one being seen at 1.20am, by which time the German Artillery fire had completely died down, and may have the significance that further artillery support is not needed. There is no doubt that the German Trenches were heavily manned, and in accordance with plan had not been knocked about to any extent. Rifle fire was heavy and continuous, but there is no evidence of a Machine Gun having been used. A large number of Very Lights were sent up the moment our barrage opened. The counter-barrage came down within three minutes, and it is clear that the enemy were very much on the alert. The gaps cut in the German wire, except at the point of the Mound, were difficult to find. It seems that on the right the Germans had been able to put a considerable amount of lose[sic] concertina to fill up what may have been a large gap cut by our artillery. In front of the Mound it was well cut, and lying about in large lumps, which of course were an obstacle. The Mound and Mound Sap had been obliterated by shell fire. No Machine Gun Emplacement was found therein, and during the whole raid only two dug-outs were encountered. This, however, is not to say that there were not a larger number, but is due to the fact that no real entry in any numbers was affected. The German Trench is reported to be 3’0” wide at top, in excellent condition, revetted with brushwood, and well floored, and about 5’0” deep. The Mound Party accounted for four or five Germans, and the Right Party claim five or six more, besides those found dead or wounded previously mentioned, evidently caused by our shell fire. Our casualties were severe, and caused chiefly by rifle fire while crossing Non Man’s Land. All four Officers were hit, one killed, and 44 Other Ranks are casualties. Up to the present 41 of these have been accounted for. It is believed that two men, who were shot dead on the wire on the right of the Mound, were not brought in. This is not yet certain. A success might have been obtained had the element of surprise been present. The long drawn out wire cutting on such a limited front, and heavy bombardment, have undoubtedly put the enemy thoroughly on the alert. The problem of keeping gaps open when once made, and at the same time conducting reconnaissances, remains to the solved. There is no doubt that two or three hours respite gives the enemy, backed by great zeal, the opportunity of mending his wire.